Vega Sicilia produces this 1982 Vega Sicilia Único , a red wine from Ribera del Duero produced with tinto fino, tempranillo and cabernet sauvignon from the 1982 vintage and has an alcoholic strength of 13.5%. 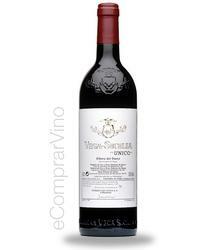 The 1982 Vega Sicilia Único is the ideal red to combine with foie and bar-b-q. Uvinum users evaluate this red wine with 3 out of 5 points. - Nose: The nose gave us a scare small tarball initial adhesive notes, aromas that vanished quickly for passage of ripe fruit, dairy, violets, fried milk, licorice, sugar toast. . .
- Palate: excellent acidity, fresh, round, polished by the bottle, elegant. 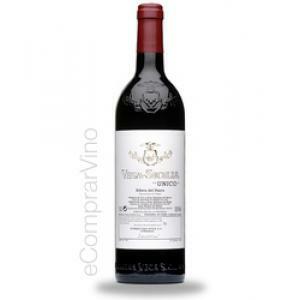 If you want to buy 1982 Vega Sicilia Único, at Uvinum you will find the best prices for Ribera del Duero red wine. On sale at Uvinum, easy and 100% safe. We bring you the largest catalog of more than 59.000 products which makes us the leading marketplace for wine, beer, and spirits in Europe with more than 38.000 customers trusting us.